In this edited volume, Jean Petrucelli brings together the work of talented clinicians and researchers steeped in working with eating disordered patients for the past 10 to 35 years. Eating disorders are about body-states and their relational meanings. The split of mindbody functioning is enacted in many arenas in the eating disordered patient's life. Concretely, a patient believes that disciplining or controlling his or her body is a means to psychic equilibrium and interpersonal effectiveness. 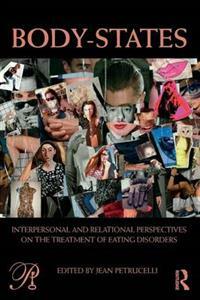 The collected papers in Body-States: Interpersonal and Relational Perspectives on the Treatment of Eating Disorders elaborates the essential role of linking symptoms with their emotional and interpersonal meanings in the context of the therapy relationship so that eating disordered patients can find their way out and survive the unbearable. The contributors bridge the gaps in varied protocols for recovery, illustrating that, at its core, trust in the reliability of the humanness of the other is necessary for patients to develop, regain, or have - for the first time - a stable body. They illustrate how embodied experience must be cultivated in the patient/therapist relationship as a felt experience so patients can experience their bodies as their own, to be lived in and enjoyed, rather than as an 'other' to be managed. In this collection Petrucelli convincingly demonstrates how interpersonal and relational treatments address eating problems, body image and "problems in living." Body States: Interpersonal and Relational Perspectives on the Treatment of Eating Disorders will be essential reading for psychoanalysts, psychotherapists, psychologists, psychiatrists, social workers, and a wide range of professionals and lay readers who are interested in the topic and treatment of eating disorders.